Early modern Amsterdam was a prosperous city renowned for its relative tolerance, and many people hoping for a better future, away from persecution, wars, and economic malaise, chose to make a new life there. Conversos and Jews from many countries were among them, attracted by the reputed wealth and benevolence of the Portuguese Jews who had settled there. Behind the facade of prosperity, however, poverty was a serious problem. It preoccupied the leadership of the Portuguese Jewish community and influenced its policy on admitting newcomers: the struggle to keep poverty under control and ensure that finances were available for welfare was paramount. Tirtsah Levie Bernfeld looks at poverty and welfare from the perspective of both benefactors and recipients. She analyses benefactors’ motives for philanthropy and charts its dimensions; she also examines the decision-making processes of communal bodies and private philanthropists, identifying the cultural influences that shaped their commitment to welfare. At the same time her detailed study succeeds in bringing the poor to life: she examines what brought them to Amsterdam, aspects of their daily life in the petitions they sent to the different welfare institutions, and the survival strategies offered by work, education, and charity. She also considers the related questions of social mobility and the motivation of the poor for joining the Amsterdam Portuguese community. Her research takes her, finally, beyond the margins of the established community to the small but active groups of Sephardi bandits who formed their own clandestine networks. Special attention is also paid to poor women, whether arriving alone or left behind and sometimes heading small family units, who were often singled out for relief. In this way the book makes a much-needed contribution to the study of gender, in Jewish society and more generally. This ground-breaking, multi-faceted study of the dynamics of the relationship between the rich and the poor adds a nuanced new dimension to our understanding of Jewish life in the early modern period. Tirtsah Levie Bernfeld was born in Rotterdam and studied history at the University of Amsterdam, at Brandeis University, and at the Hebrew University of Jerusalem, where she earned her doctorate. As an independent scholar she is involved in research on different aspects of Dutch Sephardi history during the early modern period and has written several articles on the subject. She is the co-editor of Dutch Jewish History: Proceedings of the Symposium on the History of the Jews in the Netherlands (1984). 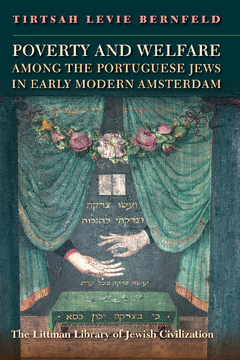 A former curator of the Jewish Museum in Amsterdam and visiting curator at the Amsterdam Historical Museum, she has also been involved in various exhibitions and publications, such as Wonen in Amsterdam in de 17de en 18de eeuw (1980), published in Portuguese as Portugueses em Amsterdão 1600–1680 (1988), and Êxodo: Portugezen in Amsterdam 1600–1680 (1987). She lives in Amsterdam. What Precisely Are We Trying to Establish? Where Did the Poor Come From?